For Boston . . .
← Bloomin’ Update 39: Spring Awakening! 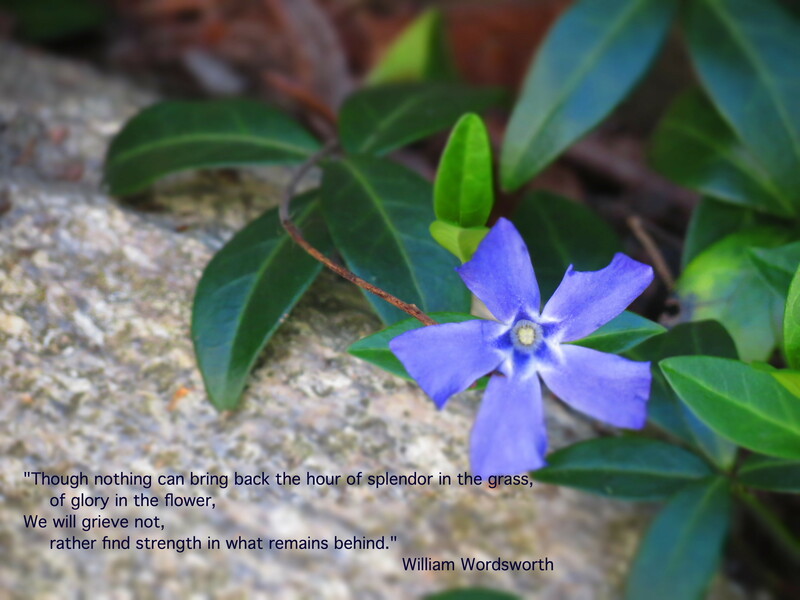 The strong poetry of Wordsworth in a time of loss for those in Boston and our nation. Thank you. Hi Cathi. There really are no words — and it seems we keep going through these moments when there are no words. Be well. I work in downtown Boston (not Back Bay) and when we first heard of the “explosion” we thought it was an infrastructure issue. When we finally learned they were bombs, everyone panicked, and began to leave the city. South Station was a nightmare. I actually stayed behind and took a later train figuring I was safer in the office than standing in a mob of people trying to get on a train. When I saw the official damage reports (human, not structural) I couldn’t believe my eyes! Why would anyone do something like this? It baffles the mind. Hi Susan. I’m glad that you’re safe — but so sad that once again, another city is dealing with loss, that communities are in mourning, and that we are witnesses to hatred and violence and the disregard for human life. Be well and be safe. Thanks Kevin — you too. How deeply you respond to the all too many disturbing events of our times, and how well. Hi Cheryl. It’s just so sad — and it’s a small gesture to show support for those impacted. Thank you and be well. It is simply awful! I love the Wordworth quote, Kevin. Absolutely perfect for the sad occasion. Hi Debra. I’ll never understand it — no matter the rationale of the culprits. Be well. Hi Flavia. Thank you so much. At times like this, we need each other — no matter the distance between us. Be well. Drawing strength from other writers and poets…isn’t it interesting as many of us aspire to inspire on wordpress. Thank God this week of horrors is done. May we pray and ask God to help those who need it the most .